C. W. Pope & Associates Pty. Ltd.
Only a few highly skilled and experienced ultrasonic (UT) inspectors can confidently assess the structural integrity of a complex shaft by examining it in-situ from one end. We have developed a system that can verify the condition of a shaft, regardless of its complexity, without relying as heavily on individual operators skill and experience. The SHAFTESTTM system achieves this by reproducibly collecting a 3D ultrasonic signature of a shaft, which can be stored for later retrieval and analysis. A cross-sectional view of the shaft at any depth provides a clear visual indication of the existence and extent of crack propagation. More importantly, cross-sectional data from different measurements can be directly compared and trended, with a graphical difference map indicating whether a crack has progressed between two measurements. We have also developed a number of advanced signal processing techniques to aid our technicians in the interpretation of complex ultrasonic signals. In particular, the system can discriminate between echoes that are reflections from crack surfaces as opposed to machined surfaces as well as identifying secondary, or mode converted echoes, that add to the complexity of the ultrasonic signal and can provide misleading defect indications. Shafts and pins are vital components of large items of plant and equipment. For example, in the coal production industry these would include: Draglines and Shovels (swing shafts, propel shafts, boom foot pins, boom suspension pins), Bucket Wheel Reclaimers (main head drive shaft), Longwall Miners (ranging arm drives, conveyor drives), Haulage Equipment (sheave shafts, winder drum shafts). Shafts and pins are susceptible to failures without apparent warning. Consequences of shaft or pin failure can be catastrophic with enormous costs in downtime, consequential damage to associated equipment and potential injury to personnel. ObjectivesObjectivesObjectives Safe operation of plant and equipment relies on pro-active maintenance aided by newly emerging condition-monitoring technologies. Operators of critical plant are particularly interested in early detection of conditions that lead to in-service failures of rotating shafts and fixed pins. Non-destructive examination (NDE) techniques have evolved that enable the detection of fatigue cracks before they reach critical size and precipitate a failure of the component. Current ultrasonic techniques are reliant on highly skilled technicians and there is a need to automate the process to make it more widely available and more reliable. There is also a desire to more accurately measure the size of crack indications and monitor crack advancement after initial detection. For many engineering components a critical crack size can be determined by application of engineering critical assessment (ECM) techniques or by reference to empirical data gained from years of experience in a typical failure, e.g. boom foot pins and walking cam shafts on draglines. Identification of cracking has been successfully carried out in shafts and pins in service for more than three decades by highly skilled technicians using manual ultrasonic techniques. Ultrasonic examination has been very successful in identifying the presence of fatigue cracks and the method is capable of locating the position of cracking along the axis of a shaft. A limitation of the technique is that the shape or extent of the crack is difficult to quantify with current manual techniques. The accuracy and repeatability of test results is extremely operator dependant. An ultrasonic testing operator must have a high level of skill in using the technique and extensive experience on the particular shaft or pin geometry to recognise a crack indication and then attempt to determine the shape characteristics from the ultrasonic response. A further limitation with current techniques lies in the storage and retrieval of UT data. Hard copy of the results of a test consists of "screen shots" that are either Polaroid photographs of an analogue oscilloscope trace or a stored bitmap image of a digital oscilloscope trace in the case of current digital ultrasonic flaw detectors. These techniques result in stored information that is of limited practical use because of repeatability problems and data storage limitations. There are also limitations in interpreting these "screen shots" away from the test area. The type of ultrasonic transducer, type of ultrasonic flaw detector and position of the probe on the component all affect the stored image. The function of the stored image is principally to aid the operator during follow up or monitoring inspections rather than as a primary test record from which an accurate crack severity determination can be made. We have developed a portable, computer based ultrasonic flaw detection machine designed specifically for shaft testing. The electronics for the transmit pulse, receive amplifier and signal digitisation are based on well-developed technology . Additionally we have developed a hardware data processing system to allow the rapid acquisition and display of the high volumes of data collected. The overall system is shown schematically in figure 1 below. Fig 1: Schematic layout of major components of the SHAFTESTTM system. The system is battery powered and connects to a single USB input of a laptop computer. In order to operate at high gain levels for large shafts the received signal is first filtered about the bandwidth of the particular UT probe being used and then digitised through an 80 MHz A/D converter. Real time averaging, to further reduce any random noise, and processing required for volume mapping is tasked to the programmable logic device (PLD) by the digital signal processor (DSP), which also controls signal timing, data transfer and communications via the USB port to the laptop computer. 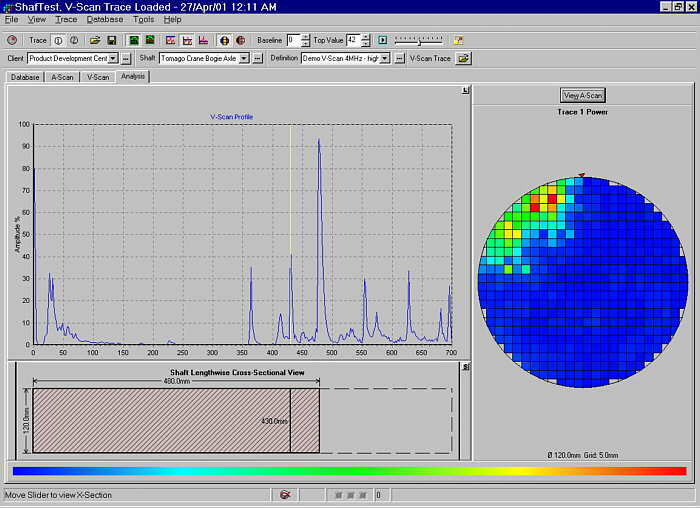 3.2 Ultrasonic Volume Mapping and Analysis -"V scan"
The system can operate in a traditional A-scan flaw detection mode. Using this mode an initial evaluation of the shaft can be made while at the same time determining the optimum parameters for data collection including: gain, range, transmit pulse voltage, signal filtering and averaging, speed of sound and calibration settings. These setting can be saved along with details of the shaft to ensure that subsequent measurements are taken under the same conditions. providing the ability to compare data from different measurements in order to test whether suspect UT indications have changed over time. To achieve this we collect a 3-dimensional UT volume map (V-scan) of the shaft by recording A-scan information at each of a set of grid locations mapped onto the end of the shaft. A camera is used to track the location of the ultrasonic probe and data is automatically collector as the probe is located in a new grid location. It should be noted that this process involves software constraints to test the validity of data at each point before it is stored with the primary aim of ensuring that all operators collect data in a consistent and reproducible manor. Shafts typically have a complex geometry consisting of splines, changes of section, lubrication and bolt holes, keyways etc. The many reflections from this array of machined features render it difficult to correctly attribute additional signals to defects. The situation is further complicated by the number of additional indications that appear as artefacts of mode conversion (compression (r) shear wave) following shallow angle reflections. As a result of the different beam path taken, mode converted echoes give a misleading indication of the position of features. The risk of erroneous analysis could be alleviated if echoes emanating from cracks could be highlighted and secondary or mode converted echoes suppressed. We have been able to achieve this by training artificial neural networks to discriminate between these different types of ultrasonic indications. After building up a database of A-scans from well characterised shafts the training data was generated by taking sections of these A-scans corresponding to known features and converting this data into the frequency domain using an FFT. The frequency components (bins) of these A-scan sections together with their known classification (crack, mode converted, machined, noise) were then fed into the neural network for training. Three neural network topologies were tested. Each of these was of a type known as a fully connected feed-forward network  as shown in figure 2. The first group of units (neurons) comprise the input layer, which accepts the data values to be interpreted. The next group of units form a "hidden" layer whose size often determines how specific a classification the neural network can make or conversely how general it might be in the case of a only a small number of units. The final layer of units is the output layer, which is often related to the number of sets to be classified. The output from the neural network was compared to the known (desired) output and the network weights adjusted until the network converged to a correct output. Fig 2: Fully connected feed-forward neural network and the supervised learning paradigm . All of our neural networks had 64 inputs to accept the frequency bins of a short trace signal and one output to determine whether the signal was of a particular type or not. The difference between the three was in the size of its hidden layer, being 64, 32 or 16 units as a single layer. We called these network designs the 64-64-1, 64-32-1, and 64-16-1 networks based on the number of units in each layer. Approximately 1000 data samples where gathered from tests shafts containing transverse fatigue cracks and analysed for training the neural networks. (At this stage we have not investigated the discrimination of longitudinal spline cracking). These were divided into those suitable for training for mode conversion and for crack detection. Each of these groups was then subdivided into 10 subgroups. One of these 10 sets was retained as a validation set while the remainder comprised the training set. For each of the 10 combinations of sets the experiment was repeated 10 times. Using random initialisation weights for the neural networks we calculated the average performance of the different network designs. Overall, this amounted to 600 training sessions. An example of the use of the V-scan approach is shown below in figure 3. At the bottom left of the display is a lengthwise cross-sectional depiction of the shaft from which the depth of interest can be selected. Above this a "V-scan profile" indicates the UT reflectivity of a transverse cross-sectional slice through the shaft as a function of depth. From this view the operator can quickly associate major UT indications with physical features of the shaft and have a clear indication of regions of the shaft that demand further analysis. On the right of the screen is displayed a transverse cross-sectional view of the UT signature of the shaft at the selected depth. The colour scale represents the UT response for each grid location. Fig 3: V-scan analysis of a defective shaft using SHAFTESTTM. In this instance a defect (crack) is clearly visible. The position and extent of the crack on the outside of the shaft was verified using magnetic particle inspection. The accuracy in terms of sizing the depth of a crack is largely a function of the type of probe used, the grid size selected and the lengthwise distance along the shaft of the feature. To monitor the progression of such a crack the system has the ability to select any two V-scan surveys and plot the difference between the two measurements as a function of depth. This feature can be particularly useful for complex shafts where the origin of a UT indication is uncertain. Although all defect indications should be thoroughly investigated, if it is clear that a defect feature is not increasing in size then the operator will be less inclined to recommend down time to replace that component. In order to sensibly compare data from one measurement to the next and trend the evolution of cracks it is essential that measurements are reproducible. A fundamental aspect of the design of the SHAFTESTTM system is to constrain operators to collect data in a consistent fashion using the same measurement parameters in each case. Furthermore, environmental variables such as the particular probe used, the temperature and rotation of a shaft are recorded to aid in the understanding of discrepancies. For the discrimination of echoes from both mode conversions and cracked surfaces we were able to train neural networks to achieve a correct classification with an average of 90% success rate. Fig 4: A-Scan showing a crack in a dark shade and mode conversions in light shades.. Figure 4 is an example of an A-scan to which this neural network processing has been applied. A colour display (black = crack and light grey = mode conversion) indicates the classification of the various ultrasonic indications. Features are automatically classified as being cracks or mode conversions with the corresponding confidence level displayed. It is important to appreciate that this process cannot guarantee a correct assessment but rather indicates that, for example, a certain indication has a high probability of being a crack. Figures 5 and 6 chart the overall performance of the neural networks trained. Each sets performance over 10 training sessions is averaged and plotted. The overall expected average performance, taking any 10% validation set from the existing sample data, is plotted along with an error bar showing 1 standard deviation to indicate the consistency of the result. Fig 5: Neural network performance for mode-conversion signal analysis.. Although the 600 neural network training sessions took considerable time to complete, nearly 4 days of computational time on a 700MHz Pentium III processor, the resulting networks are promising in terms of their performance on data not used in the training sets, with most networks providing a correct prediction somewhere between 80-100% of the time. Fig 6: Neural network performance for crack detection signal analysis. We discovered that the neural network with a small hidden layer of 16 units performed better due to its generalization ability, while the larger hidden layer networks over-fitted the training data and failed more often to recognize new data, although their performance was quite acceptable. This trend is less noticeable in the case of the crack detection. We believe that the SHAFTESTTM system represents a major advance toward more reliable and accurate assessment of the structural integrity of shafts and pins. The results presented here for the neural network analysis of A-scan data are extremely promising. At this stage we need to do further testing to determine how generally these neural networks can be applied. For example, it may be the case that we will need to train a number of different neural networks to cover a range of specific sizes or shaft geometries. We will also investigate the application of this technique for the discrimination of longitudinal spline cracking. Completion of this project was made possible with the financial support of the Australian Coal Association Research Program (ACARP); project number C7005.